We are supplying Bush Parts , Bearing parts (Universal Joint Cross) at very competitive price to or esteemed customers. Packaging Details: We provide wooden box packing of size 100x80x54 cms. Packaging Details Sea worthy wooden cases. 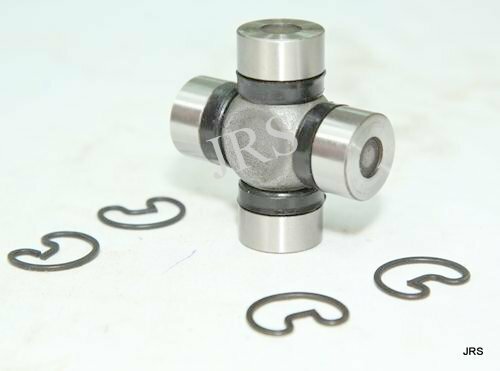 JRS Farmparts is unit of Eastman Industries Limited and has emerged as preeminent firm in Manufacturer , Exporter and Supplier of Tractor Linkage Parts, Harvester Parts and Forging parts and Trailer parts. We provide best quality Tractor Pins, Clevis Pins, and Levelling Stabilizer Arms Assemblies. Our offered products have gained much acceptance in the market for their resilient design, excellent finishing, dimensional accuracy and long functional life. We continue to bring the latest state-of-art technological improvement through the regular analysis of critical aspects of manufacturing process with the approach of quality improvement. All our products are manufactured from the quality tested raw material and cutting-edge technology as per the industry set norms. The manufacturing is supported by latest fully automatic machines. Furthermore, our competitive price policy has provided us huge client base to serve. We are exporting our quality products in USA, Canada, Europe, Africa, Australia, Asian Country. With perfect affinity of our expertise with modern infrastructure system, we are able to fabricate wide gamut of products for fulfilling divergent demands of the market. It is extensively used to install in various agricultural and construction machines. We incorporate a team of assiduous professional for manufacturing of products with their effective managing skills. We have adopted total quality management and set-up proper quality mechanisms to check all our products. Moreover, we market our products through the wide distributing network with utmost packaging quality under the definite assurance of in time deliverance.